I came across an article from HuffPo this week on How to Become a Goodreads Power User (and why you’d want to). Blogs like this are the exact reason why I created AuthorDiscovery.com. The article contains some helpful information but is still so general that authors reading it are left not knowing where to start first. This was confirmed in several interactions in the various author groups in which I participate. I believe authors know and agree they need to have a presence on goodreads, but don’t know what they should be doing on goodreads in order to get found by readers (which is the point). In their defense, goodreads has tried to demonstrate how goodreads can be great for book and author discovery (this slideshare presentation is helpful as well as these author tips), but the interface is certainly difficult to navigate, and there are so many features on goodreads, it can be difficult to know where to start. In this article, I endeavor to provide the only 5 things you must do on goodreads to be discovered by your desired readers. By the end of reading this, you should have a much clearer strategy of exactly what you need to do to be successful on this essential author discovery platform. If you don’t, please ask for additional clarity in the comments and I will do my best to elaborate or clarify anything that is confusing. If you’re using goodreads correctly, at some point readers will discover your name in a goodreads group, your book on a friends bookshelf, or some other means and this is your opportunity to bring them further into your discovery web. When they click on your name, they need to see an optimized author profile. I’ve already discussed the importance of author profiles in a previous post, but they are exceptionally important on goodreads. A recent stat suggests only 57% of authors even have profiles on goodreads, so this is not as basic as it may seem. Now imagine that I am a reader coming upon your optimized author profile. I basically learn everything I need to know about you on a single page and there are so many goodies to keep me engaged with you. As a reader I can friend or fan you. I can follow your reviews. I can like and comment on your blog posts, pictures, and videos. I can add your books to my bookshelf. I can recommend books of yours that I’ve read to my friends, and join groups of which you are a member. I can follow you on twitter and check out your website. If you don’t have an author profile or a unoptimized one, it limits my ability as a reader to interact with you, which is not a good thing when it comes to author discovery. Similar to the author profile, readers have many places they can and will discover your work on goodreads. From group bookshelves to giveaways to ads and many others, when readers click on your book, they need to see an optimized book profile. The good news here is that the goodreads librarians do a pretty good job of making sure that most book profiles have at least the basics covered (cover photo, blurb, year of publication, ISBN). But there are several other things about a book profile that only you as the author can do. Only you can add your e-book so readers can sample your book. Only you can (or will) add any detail of awards you’ve won, characters in your book, and trivia or quizzes about your book to further engage readers who come to your book pages. And be careful with your author bio, because it shows up on all your book pages. I f the goodreads librarians have not added the basic book information (cover photo, blurb, year of publication, ISBN), then start here and then work on the rest. The worst thing that can happen is if your book is not even visible on goodreads. Search for your title. If you see something like this image, you need to manually add your book yourself. Now that you’ve optimized your author and book pages, the fun can begin – interacting with readers! The bookshelf is the key objective here because once a book is on a readers bookshelf, it becomes visible to all their friends, and all their interactions with that book become spread as well. There are a few ways to go about getting on reader’s bookshelves but let me give you my opinion of the best way to kick-off the process. The first thing to do is to find your (real) friends who are already on goodreads and get them to add your book to their shelves. Goodreads integrates with facebook, twitter, and e-mail and has a pretty easy way to help you find friends who are already on goodreads. Once they accept your friend request, use facebook, e-mail, or twitter to ask them to add your book to their bookshelves. After your friends have added your book, its time to interact with people you don’t know. As tempting as it may be to search for writer’s who write similar works to your own and begin spamming people who have read their work to get them to read yours, this will get you blocked and maybe even kicked off of goodreads! The best way I have found to make friends on goodreads (and get people to add me to their shelves) is to leverage groups. On goodreads, it seems like there is a group for nearly ever genre and topic niche. Most of the groups have a place for you to introduce yourself to the group. I usually immediately friend any person who responds to my introductory message and introduce my book to them on a one on one basis. Sometimes they add the book and sometimes they don’t. But at least they don’t feel spammed by me. The other tactic is to actually ENGAGE in discussions or START discussions in the groups in which you are now a member. Your objective is not to talk about your book, but to make friends. Once people are your friends, it is much easier to introduce your work and get added to their shelves. You can also add your book to most group bookshelves or at least introduce your book to the group moderators if this function has been disabled. This is a simple way to gain visibility for your book amongst people who read what you write. The next two options involve some financial expenditure from you, so you need to understand the return on investment here. Goodreads offers a self-serving advertising option that allows you to target and promote your book throughout goodreads via paid advertisements. You can use the ads to get readers to click off to Amazon to buy your book, but the most successful ads on goodreads either promote a giveaway or have a call to action for readers to add your book to their shelves. The best thing about goodreads ads is that you are only charged if the reader actually clicks your ad. If they add your book to their shelf, you are not charged. To illustrate, I have been advertising on goodreads since last March. I set up a $300 initial advertising investment and began experimenting with different ad copy and targeting options. Since last March, my ads have been viewed 940,000 times, clicked on 558 times, and my book has been added to 2,500 shelves. 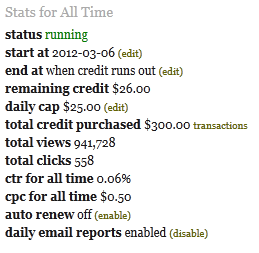 I have only been charged for the 558 clicks, not the books added, and I have yet to exhaust my initial $300 investment. Despite these benefits, a fair criticism of the goodreads ads mechanism is that the number of views are wildly variable. Some days the ad is shown thousands of times, and others it may not be shown at all, without any rhyme or reason. I would only recommend dabbling in advertising if you have a good working understanding of cost per click advertising and more importantly have free cash flow to invest. Another way to get readers to add your book to their shelves en mass, is to hold a giveaway on goodreads. Unfortunately, this feature is currently only available to authors who have print copies of their books available. The average giveaway on goodreads nets 870 readers (for a giveaway of 10-20 books) which is a great way to build awareness of your book and get added to bookshelves at the same time. And the winners of your giveaway usually are quite happy to give you a review or rating which is your next goodreads objective. I have conducted two giveaways that attracted a total of 1,738 readers who would have never known about me or my work otherwise. And because my book is on their shelves, their friends know about my book as well. You can advertise your giveaways on your other social media properties and website as well. Still, it is not enough just to make it on to a prospective reader’s bookshelf. You want them to read, rate, review (and hopefully love) your book. And even reviews are not enough to truly break out of the pack. You really want readers talking about and engaging with your books, blogs, videos, tweets, pins, and posts. But let’s start with reviews. Once again, groups are your best option here. There are many groups on goodreads where there are hundreds of readers who are actually asking for books to review. I’d start there. You can also approach top reviewers on goodreads and offer a free digital copy of your book in exchange for an honest review. Once you’ve got the reviews coming in, this is where your author and book profiles begin to work for you. As friends of reviewers read their reviews, click on your book (or author profile), they get pulled in to the conversation by your blog posts, videos, and other engaging content. They find other discussions you have been involved in on goodreads or even those specific to your book. They follow you on twitter and facebook and become true fans, eagerly waiting for your next book to come out. Now, a word here on interacting and talking with readers on goodreads. First of all, you are going to get bad reviews. When you do, you should never, ever, enter into a dialogue with said reviewer. There is far more to lose than to gain. Second, when someone gives you a glowing review, you should like the review, add them as a friend, and suggest they post the review to Amazon. You can invite them to participate in a Q&A or offer to answer any specific questions they have about the book. This one on one interaction between readers and authors makes goodreads a gold mine. I could have just called this, act like you are a reader, and it would convey the point exactly. As authors, we are some of the most avid readers around (or at least we should be). Because we also write, we have a perspective and viewpoint that is sure to be appreciated by other readers on goodreads. Remember, each interaction you have on goodreads has the potential to bring a reader back to your author profile. 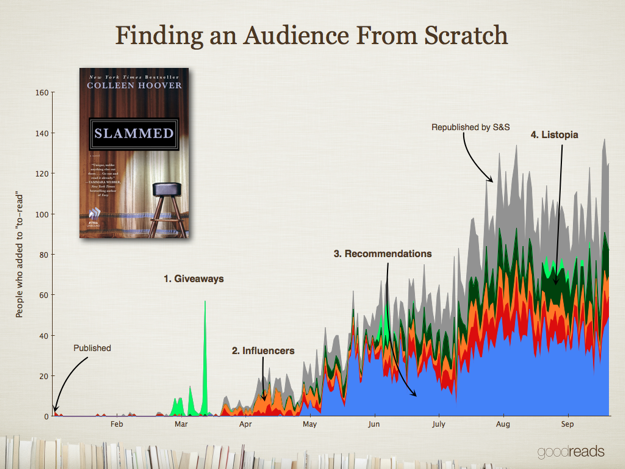 That’s why remaining active is the most important discoverability tactic on goodreads. Rate and review books you’ve read, identify books you plan to read and are currently reading. Recommend books to your old and new friends. Discuss books you are reading or have read with other readers. Pretend you actually find value in the site’s many great features for readers and you may even begin to understand what all the fuss is about. 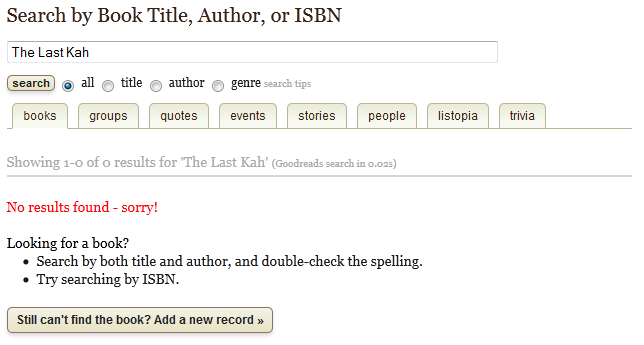 What did I miss in terms of the keys to discoverability success on goodreads? What questions can I clear up for you? Excellent article! Thank you and very well done! I enjoyed the article. Thank you for your openness. Question: You mention that there are groups on Goodreads in which members have stated that they are looking for vooks to review. Which groups are these? How can an author find them? Thanks for the feedback! There are many groups on goodreads. My suggestion is to search for your genre under groups and see which groups turn up and then join these groups. I’m glad you did, Brenda! My pleasure. I hope it makes things a bit easier. Great information! I’ve been feeling overwhelmed by all the social media I do and now to add Goodreads to the list of learning how to navigate was stressing me out! This does help to clarify the steps I need to do. Thanks! This is a great article with lots of useful information. Thank you for sharing. Thanks for reading and commenting, Dale. What site do you use for your blog? I would be entirely lost if it weren’t for people like yourself, willing to share you knowledge regarding getting ourselves out there. Thank you for your input. People like yourself are like finding diamonds in the sand, not so easy to come by. Especially the very knowledgeable. Awesome article with great insight! Thank you! For somebody advising authors your grammar is bit off! Which tends to undermine your credibility. Why do you put apostrophes where they don’t belong? I guess this just makes the point that every author needs an editor! Excellent article. I am in the process of building awareness for my first novel.I have spent a small amount on advertising and have now started a giveaway. I have been pleased with the response so far but this article has shown me many more things I can be doing to help things along. Very often author blogs seem to be an excuse to state the obvious and show off. This was not one of those articles. In your article you mention that there are groups with hundreds of readers that are asking for books to review. Could you please elaborate by providing specific examples of these groups or by directing me to how I can locate these groups for myself. As a Goodreads Author, I would enjoy participating in these kinds of groups. Thank you for the informative article. I specifically found the “ad” information interesting and I will use your suggestion to focus one of my Goodreads ads on reviews. Very helpful. I’ve been a Goodreads author for sometime now, but after reading your post, I updated my author profile! I’m going to share this on my twitter page, @cdivakaruni. Thanks.